What Celebrity Mistakes Can Teach Us About Estate Planning | The Levin Law Firm - Philip Levin, Esq. Putting our legal and financial affairs in order, before it’s too late, is vitally important. These 10 Celebrity Estate Planning Mistakes, detailed in Forbes Magazine, can help spring your clients into taking the necessary steps to protect and preserve their property. Just like regular folks, celebrities flub their estate planning, costing their intended heirs money and/or grief. What’s different? Bigger dollar amounts and notoriety, mostly. A new book, Trial & Heirs, by probate litigator Andrew W. Mayoras and his estate lawyer wife, Danielle B. Mayoras, details celebrity cases to provide real-life advice that is relevant to all of our clients. 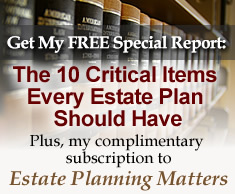 You can educate your clients about the importance of engaging an experienced estate planning attorney to help them plan now to protect their estate. We invite you to contact The Levin Law Firm to schedule a Complimentary Consultation by calling our office at (610) 977-2443.